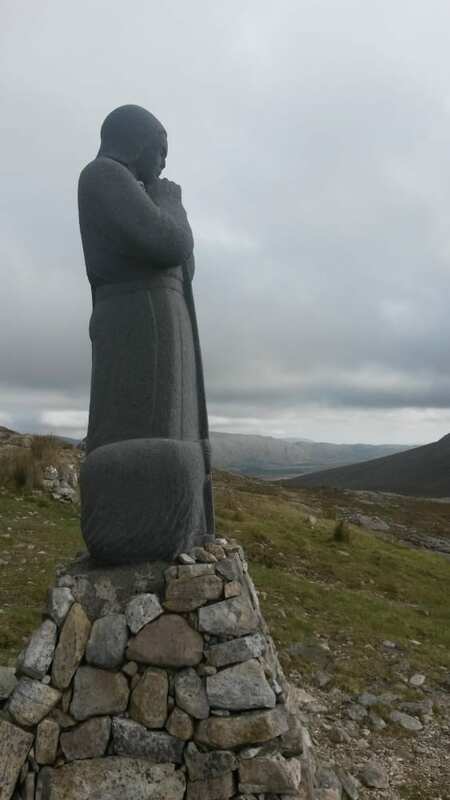 Patrick is the patron saint of Ireland, and the most well-known of all the Celtic saints. He was born in 390 near England’s west coast or in Wales. When he was young, about sixteen years old, he was captured by pirates and taken to Ireland where he lived as a slave for six years. He endured many hardships including hunger, thirst, and cold under the rule of a cruel pagan king. It was during his enslavement, while spending long hours in solitude tending sheep, that he had a spiritual awakening. Through dreams and other voices, Patrick was able to escape and return back home again. I find St. Patrick’s story intriguing. Here was a man enslaved, who escaped by divine intervention, and then hears the call to return to the land of his slavery and he goes willingly. There are churches founded by Patrick in the area around Galway. One of my favorite sites is Inchgoaill, an island on Lough Corrib, just a few miles north of us. Legend tells us that Patrick was banished here for a time by local druids. The name of the place means “island of the stranger.” The island is now uninhabited, but there is a stone church at the site where Patrick’s 5th century wooden church would have been, as well as a marker stone where his nephew and navigator is buried, one of the oldest Christian markers we have. Seeking out this “strangeness” and “exile” was at the heart of the monastic call. In going to the places which make us feel uncomfortable and staying with our experience, rather than running away, they cracked themselves open to receive the Spirit in new ways. If the stories and inspiration of the Celtic Saints calls to you, please consider joining us for The Soul’s Slow Ripening, an online retreat this spring which explores Celtic wisdom for discernment. We have a discount for early registration which ends March 15th.